What Is Visual Field Test? To ensure eye health, visual field tests, apart from other eye-checking procedures, are needed, which can help examine the visual problems. A person's visual health is an important part of his or her quality of life. This is why eye examinations are so important. In addition to a basic eye exam, an optometrist might also perform a visual field test. A visual field test is more comprehensive than the standard exam and is able to detect central and peripheral vision problems. These problems can be caused by problems with eye health, such as glaucoma, as well as other medical issues, such as brain problems or stroke. These health issues can lead to optic nerve damage or damage to the inner lining of the eyes. The visual field test examines the full vertical and horizontal range of what a person can see with his or her peripheral vision. Peripheral vision is also known as side vision and is what people refer to when they use the phrase, "I saw it out of the corner of my eye." The visual field test shows whether a person is experiencing problems with peripheral vision by detecting the presence of blind spots, which are called scotomas. The size and shape of the scotoma indicates what the cause might be. For instance, if there is damage to the optic nerve, a person will experience a specific visual field defect unlike any other. In addition, doctors are able to use the shape, size, and location of the visual field defect to determine the size and location of a stroke or brain tumor. What Does a Visual Field Test Include? 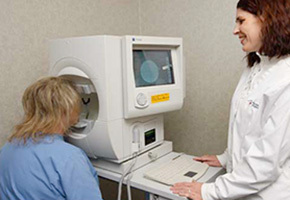 A visual field test is administered as part of a comprehensive eye exam. The test includes several parts. An optometrist typically uses confrontation visual field testing to determine if further field testing is required. In confrontation testing, one eye is covered and the other focuses on a target object. The optometrist then asks the patient to describe what is seen in the side field of vision. Once the optometrist determines the description is missing object descriptions or problematic in any other way, he will perform additional testing. These tests include the automated perimetry test, the frequency doubling perimetry test, and the electroretinography test below. Several automated perimetry tests might be used to measure the patient's response to objects in different parts of their field of vision. The patient places his head in a chin rest so there is no movement. While staring at a light in the straight-away distance, he is asked to press a button each time a light appears outside of the central vision field. These lights vary in intensity and are flashed in different parts of his peripheral field of vision. If the patient fails to respond at any time a light appears, his doctor knows there is a problem with that location. The frequency doubling perimitry test uses an optical illusion to test a person's peripheral vision. The illusion features two bars in contrasting colors on a screen. As they flicker at high frequency, they appear to double. This illusion is caused by the unique response of specific cells in the retina. If a patient is unable to see the bars at any time during the test, it could indicate damage to the optic nerve or another part of the eye. Finally, the electroretinography is used to measure electrical activity in the retina. The test uses a strobe light or checkerboard pattern of light to determine how the photoreceptor cells in the retina react to stimuli. This test is performed with an electrode on the front surface of the eye that measures the reaction in an electroretinogram. The results allow the optometrist to diagnose acquired and hereditary disorders within the retina. These can include detachment, retinitis pigmentosa, and functional changes related to diseases not directly associated with eye health, such as diabetes or heart disease. What Does a Complete Eye Test Include? In addition to a visual field test, a comprehensive exam will check your vision for other problems. Some of these tests are basic, while others look for specific vision problems. The first test will be a visual acuity test. This is the test most people are familiar with and it involves covering each eye and reading a charge with letters and shapes. The test measures a person's distance visual ability, so his or her doctor can diagnose common vision problems, such as near- and far-sightedness. Another basic test is the slit-lamp or biomicroscope examination. The device makes it possible for the optometrist to see a highly magnified view of the internal structure of the eye. It is an effective way to diagnose early problems and detect signs of infection or disease. During the test, a patient places his chin in a rest and light is shined into his eyes. The doctor views the eye through oculars, which make it possible to get a microscope-like view of the eye. The examination includes the eyelids, conjunctiva, iris, and cornea, as well as the macular, retina, and optic nerve. The test is able to alert the optometrist to problems such as cataracts, corneal ulcers, macular degeneration, and diabetic retinopathy. The retinoscopy test helps to determine the eyeglass prescription based on the way in which light reflects from the eyes. The refraction test is used to determine the exact prescription. Autorefractors and aberrometers are devices that can also be useful in determining a patient's prescription. An important part of the eye exam is the dilation of the pupils. This is done with dilating drops and allows doctor to get a better view of the eye's internal structure. When your pupils are dilates, your eyes will be very sensitive to light and it can be difficult to focus on certain objects. Dilation can last for several hours following the administration of the drops, so you should bring sunglasses or request a pair of disposable glasses after your exam. You might also require assistance with driving. In addition to the acuity test and the slit-lamp test, patients might also undergo a color blind test, a cover test to check if the eyes work together correctly, and a glaucoma test to determine if the disease has developed. If the optometrist believes eyeglasses are needed to correct a vision problem, several additional tests may be performed. Pink eye treatment may include antibiotics, antihistamines, vasoconstrictors, and mast cell stabilizers. It is important to consult a doctor for proper diagnosis and choice of treatment. What Is Bladeless Lasik and How Does It Help?